Eastern North Carolina has a wealth of natural and working lands that are important to the nation’s defense, as recognized in an exciting announcement from N.C. Agriculture Commissioner, Steve Troxler, earlier this week. 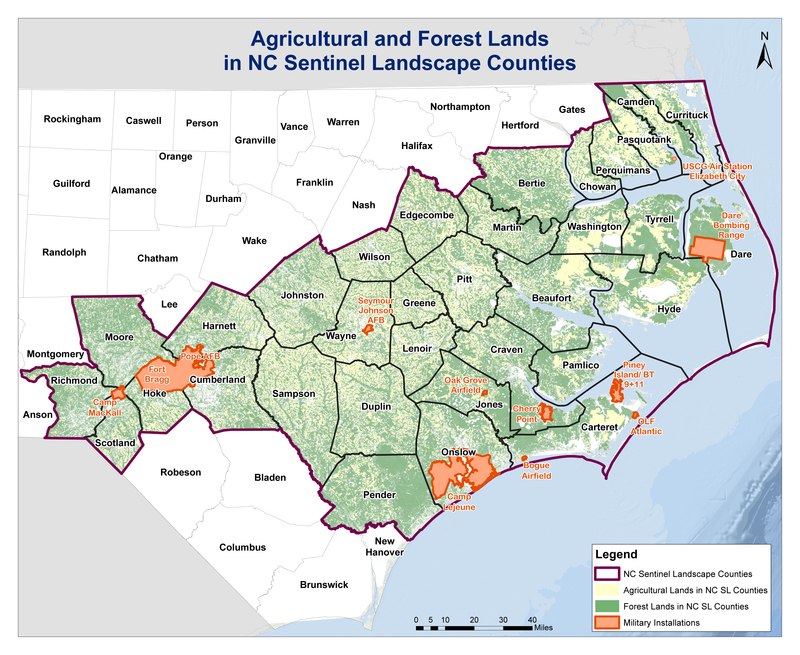 As part of the North Carolina Sentinel Landscape Partnership, 33 eastern counties in North Carolina were federally designated as Sentinel Landscapes. Of these, 24 counties are located in the Albemarle-Pamlico watershed. The Sentinel Landscape designation is a new opportunity to bring together a diverse group of partners in North Carolina to advance cooperative conservation efforts. Stemming from a joint federal partnership between the U.S. Departments of Agriculture, Interior and Defense, Sentinel Landscape designations are being established around the country to preserve conservation lands, working farmland, and forests that are adjacent to military training grounds. The partnership will benefit national security efforts while complementing efforts to preserve working agricultural and forest lands and restore and protect habitats. The voluntary program will give landowners in designated counties opportunities to conserve lands vital to agricultural, forestry, and military interests. The designation provides communities access to resources and provides incentives that help encourage compatible land uses in areas where conservation, working lands, and national defense interests converge. North Carolina is the first state with multiple military services, military installations and counties named as part of the designation. To learn more about North Carolina's designation, visit https://sentinellandscapes.wordpress.ncsu.edu/. The Albemarle-Pamlico National Estuary Partnership is pleased to be a part of the growing list of partners that will continue to work to advance the partnership forward. We look forward to collaborating with partners on this landscape scale effort that will protect and restore ecosystem processes, as outlined in Action D1.2 of our Comprehensive Conservation and Management Plan. The designation also strengthens the findings recognized in our recent Economic Valuation of the diverse natural resources within the Albemarle-Pamlico watershed. Press release: "Troxler announces N.C. Sentinel Landscape designation"